As most high school age young adults were milking the remaining days of summer, a legion of athletes committed to fall high school sports spent their days in the midst of pre-season workouts. The hope is that the hard work will pay off come game time. Now with school started, competition kicks off for the cross-country, volleyball and soccer teams. Here’s a look at what lay ahead for all three teams. Last year’s assistant coach Emma Catmur has moved into the head coach position this year with her father Martin joining her as the assistant. Fortunately for both, they are taking over a well-established program that annually sends its girls’ team to the state meet. This season, four girls return from the team that finished in fifth place at the state meet last year. Senior Emma Vosburg leads the team of 10 total runners this year. Vosburg is in her final high school year competing on the team and brings the leadership around which the Tres Amigas will rally. Who are the Tres Amigas? They are three sophomores Erin Kelly, Hannah Smith and Madeline Malzhan, who stormed onto the cross-country high school racing scene last year as freshmen. Senior Maddison Garcia joins the team this year as well, bringing her individual success at the national level to the team. Catmur has three boys on the team this year. Junior Nicholas Harper-Johnston returns with his sights set on reaching the state meet this year. Sophomore Jeffery Hargrove is back and freshman David Bright steps into high school competition. Catmur is pleased with their workouts thus far but it’s all a relative mystery until they step to the starting line at their first meet. Catmur is taking five of her athletes to compete in Ft. Collins on Thursday, August 28 and to get a preview of the state meet venue. The rest of the team will open their season with a meet in Delta on Saturday, August 30. Coaches Marla Covey and Amy Shellenberger had an unprecedented 27 girls turn out for volleyball this season, including four seniors. Mackenzie Mailly and seasoned setter Kaitlin Councilman were decorated all-conference players last year. Katie Vandervoort and Chelsea Dill join them as leaders who will hopefully take the team to a top-two finish in their new league. The Mountain League dissolved last year as schools grew and moved to different classes. That forced Crested Butte to move into the Southern Peaks League with schools their size such as Creede, Saguache and Sierra Grande—unfamiliar territory for the Titans spikers. Juniors Hillary Spencer and Sydney Loyed, who was all-conference honorable mention last season, enforce the veteran presence on the team this year, giving Covey and Shellenberger the starting ingredients for a potent Titans volleyball mix. The team opened with a scrimmage in Montrose on Saturday, August 23 and while Covey was short some players due to injuries and other issues, the skeleton crew proved competitive in four matches. “I think they held their own,” says Covey. They start the regular season playing host to league opponent Mountain Valley at Mt. Olympus on Friday, August 29. 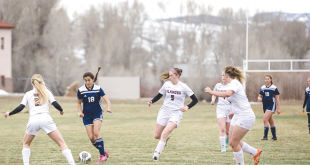 The Crested Butte Titans soccer team came in second place in the Southwest League and made it to the state tournament last year for the fourth year in a row. Unfortunately, for the fourth year in a row, a Front Range powerhouse eliminated them in the first round. With that in mind, it is the goal of both coach Than Acuff and the team to win their league and thus get a better seed in the post-season and make it past the first round. Assistant coach Meredith McNamara joins Acuff this year to help execute the plan. McNamara hails from Penn State where she played goalkeeper for the women’s soccer team. The coaches have the luxury of four returning starters to their line up. Senior strikers John Wright and Jack Linehan and midfielder Robbie Holleran should provide some high octane offense while Jeremy Clayton will anchor the defense at the sweeper position. Junior Jenner Currier will move into the center midfielder spot to help organize and direct the attack, and junior Connor McGuire will rotate between defense and midfield to provide stability and touch where needed. Sophomores Sky Egelhoff and Sam Evans both played pivotal roles on offense and defense last year and will be called upon to step up even more this season. Sophomores Henry Linehan and Mick Osmundson will work the outside midfield spots and sophomore Ben Frame steps into the mouth of the wolf as the starting goalkeeper. While the upper classes are thin in numbers, Acuff and McNamara have a solid legion of freshmen to work with to reach success this season and in seasons to come. Titans soccer opens its season with a tournament in Colorado Springs on Friday and Saturday, August 29-30. 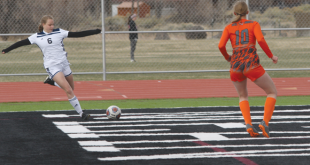 They open league play at home against Telluride on Saturday, September 6 at 11 a.m.